A leap in the evolution of culture and consciousness is happening right now, all over the world. Every day, hundreds if not thousands of people confront big questions, contradictions and paradoxes, and discover their awareness growing to transcend the limitations of yesterday. Some discover the social cohesion that happens when they sublimate their urges to following the rules. Some discover the freedom of knowing internally what is right and wrong that transcends following rules. Some discover a new freedom by learning to be an objective observer and verify and extend their understanding of natural rules. Some discover a deeper appreciation of another’s worldview by virtually putting themselves in another’s shoes. A few discover a spiraling pattern of ever widening circles of culture and consciousness; larger circles that include the wisdom of the inner circles and exhibit a higher, emergent wisdom and insight beyond those inner circles. The principles of evolution appear in the growth of human culture and consciousness. In the last twenty-five years, integral philosophy has emerged to describe how evolution drives culture and consciousness in the direction of greater complexity, diversity, span, depth and greater truth, beauty and goodness. I first came across integral philosophy by encountering the writings of a fellow named Ken Wilber. An independent scholar with an amazing mental capacity, he struggled to try to find a way to bring together the discoveries and insights of philosophy, religion and science. He discovered an evolutionary paradigm that allowed him to powerfully interrelate them. Breakthroughs in developmental psychology, systems theory, chaos theory, process philosophy, and cultural anthropology, to name a few disciplines, when interrelated with the great thinkers throughout history, helped build a base of understanding on which Wilber and others have constructed the integral approach. Think of our congregation. Individuals develop their own sense of truth and meaning here. We have no creeds or dogma that define our beliefs. 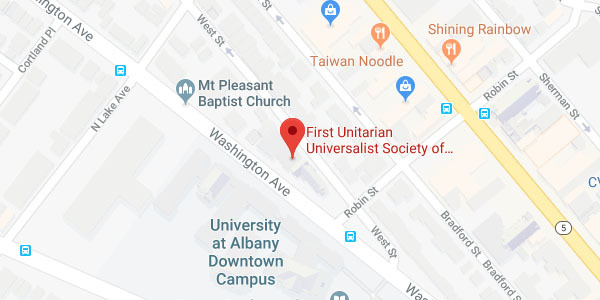 Yet each Unitarian Universalist congregation develops an identity that has much in common with all the other Unitarian Universalist congregations. This identity transcends any individual’s beliefs but also manages to include them. First time attendees at our yearly annual meeting called General Assembly are often impressed by how affirmed they feel by being with Unitarian Universalists from all over the world. There is plenty of diversity, as attending a selection of the GA workshops will attest, but the message of the General Assembly is powerfully unifying and transcends any individual point of view. This aggregation of parts into wholes, and wholes that become parts of greater wholes, exhibits emergent properties when the right amount of energy is added to the system. Too little energy, nothing happens. Too much energy, it flies apart. With just the right amount, atoms organize into molecules, molecules into membranes, membranes into cells, cells into organisms. As larger groups of people congregate together, they develop from families to tribes, from tribes to settled villages, from villages to empires, from empires to nation states.. Looking at the history of civilization, seeing the increase in human population matches the resulting increases in social organization and complexity, illustrates how individuals come together to create a culture that is greater than any individual. Cultural anthropologists have noticed the size of a self-identified group of people control the values of a particular culture. These patterns of size and value are similar all around the world. The integral, evolutionary approach really starts with the big bang and continues today without an endpoint in site. Integral philosophy deals with how to become awake to evolutionary processes happening in our minds and society right now and how to work with them rather than against them. It understands history as the steps and mis-steps as evolution zigzags toward higher and higher order and greater and greater diversity. These evolutionary forces are at work right now in our minds. The good news is we can be in relationship with them and allow them to shape us and move us in our daily encounters with the world. People who do creative work know this process of evolutionary emergence as they hold all the parts of a problem or puzzle together until, in a flash, they see how they integrate together. We can train our minds to increase our capacity to allow this creative energy to move through us. Living a moral life helps. Developing our ability to concentrate helps. Sharpening our ability to witness the present moment helps. Learning when and when not to lower your defenses helps. Increasing our emotional and aesthetic sensitivity helps. Study and scholarship help. All contribute to an ever widening, deepening and expanding inclusion that encourage the emergence of novelty, the ongoing process of creation … through us. As sentient beings, we have the privilege of being a conscious participant in this process. And being a conscious integrating agent of evolution is one of the most valuable and fulfilling meanings of life.